This is just one in the Then And Now Series of books depicting famous cities, past and present. Rome has been around since the year dot and having visited the city some eighteen years ago, not that much seems to have changed, which is one of the reasons I love the city so much. All of those incredible buildings, designed and built by true artists, still stand today as a testament to their brilliance. Of course, nowadays, the city is much more streamlined to accommodate the population and tourism growth, but in essence, many of the famous structures and bridges are as there were. There are familiar sights such as the Trevi Fountain, the Spanish Steps, of course the Colosseum, and Portia Settimiana. The difference time has made to St. Peter's Square, where the Vatican is, is remarkable and thankfully, pretty much as it always has been. This city with so much history is a beautiful one and this book captures so much of this exquisite beauty. It's elegant and although smaller than I imagined, Rome is nevertheless very beautiful and jammed with incredible historical stories from so long ago. It's enough to make you want to pack your bags and go and see this city for yourself, or, for the second or third time. I've also reviewed their books on Havana, San Francisco, and Las Vegas and there are many other cities too, like London, Chicago, and New York to name a few. 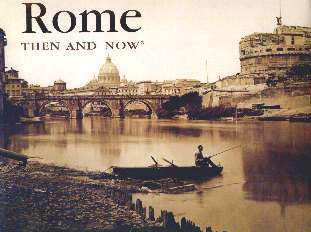 ROME Then And Now may be purchased and/or ordered through your local bookstore. Conclusion - Another super edition and another for collectors' shelves.